Julia and Hozana met the way many couples do these days: through Facebook. They were both attracted to each other’s creative sides as well as their love for God. When they finally met face to face, they knew instantly that they were meant to be. After spending the entirety of their relationship living in different cities, when it came time for their wedding day, they definitely celebrated being united. Julia’s amazing taste shined through every detail. 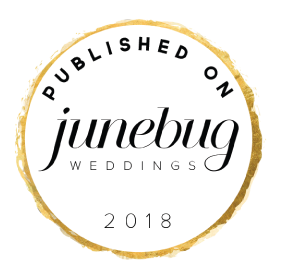 Julia, a wedding photographer, was meticulous about the styling of every detail throughout the day, from bridesmaids gowns of blush pink chiffon and glittering rose gold sequins to beautifully simple florals and lush greenery. They wanted their ceremony to move their guests with its beauty, but this Houston barn wedding was full of glitz and glamour from start to finish. The breathtaking modern barn made up of bright white spaces, massive windows and fabulous feathered chandeliers was the perfect setting for their tender foot-washing ceremony meant to signify their vow to serve each other for life. The ceremony was so full of love that everyone, even us, were in tears for it! I met these two via social media as well. It was my first time shooting two photographers and holy crap was the pressure on! After speaking with them via Skype, I knew… it was going to be an amazing experience both emotionally and aesthetically. And it definitely did not disappoint. I flew in the day before and set up home at a hotel about 15 minutes out and posted up at a Buffalo Wild Wings with a book and a beer on the patio. I’ve never been known to be the most “religious” of types, and I knew Julia and Hozana were very deep in their faith. On the way to the venue, I noticed the super thick clouds which mean only one thing to me: epic photos. Everything about this day was falling into place. Two beautiful souls, phenomenal red hair x’s two, immaculate details. And out of no where, I felt this rush of emotion that pushed me to pray. I don’t regularly pray so I was taken aback at the fact I felt I HAD to pray. And so, I did. I prayed for the day to run smooth. I prayed for the family to all be present and experience what I can only explain as a real life Disney movie. I prayed for safety of all traveling there and lastly, I prayed that there was a consistent sense of calm and love. I don’t know if it was just seeing how incredibly strong willed these two were in their faith, or the amount of love and kindness they just effortlessly exuded, but I wasn’t getting out of that car without praying, which I rarely do. Maybe the day was bound to be as perfect as it was, and maybe all the prayers I’m sure were sent up worked… but I’m 100% sure I will never experience a presence as I did at this ceremony. The ugly cry was real and chills didn’t stop until I boarded my plane home. I’m forever grateful to these two. Thank you both for gifting me a front row ticket to the best love story I’ve ever seen.